The story of this club has been told before but we can recount it here from a Club Historians point of view. The Every Man’s Club was not a working men’s club with a constitution, a membership and a committee. It had an open door policy, was run by a pastor and was ‘dry’- tea was the main beverage here. But it was a club in every sense of the word. The typical leisure activities of the soldiers who visited were similar to those on offer in any club back home: dominoes, billiards, cards, reading, smoking and chatting. And, as it happens, there is a strong connection to the brewing industry. Although Talbot House was ‘dry’, it was beer industry profit that made the premises available in the first place! 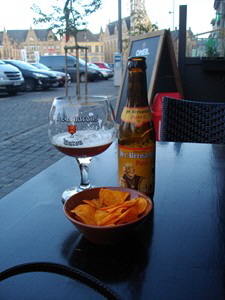 Belgium is famed for its hops and long brewing tradition. If you visit any bar at any time there, you’ll be spoilt for choice! He and senior chaplain in Poperinge, Neville Talbot, were urged by Quartermaster of the 6th Division, Lt. Col. Reginald May to approach the Town Major about possible premises. An introduction followed to Maurice Coevoet-Camerlynck who took them to a half empty, damaged mansion. The old house was once owned by a local family of hop traders- the Lebbe family- so the beer link is quite strong to the teetotal Every Man’s Club!